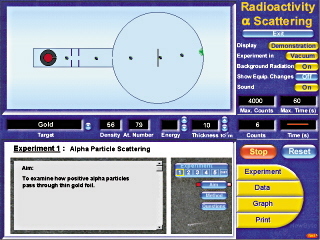 Examine the effect of Alpha, Beta or Gamma radiation with 12 radioactive sources and 100 unknown sources for testing. Use 12 barrier materials including gold and paper and set barrier thickness to between 0.01 and 9mm. Export data for later analysis. Observe Alpha, Beta or Gamma radiation in air and vacuum. Turn off background radiation to simplify your experiment. 12 radioactive sources and 100 unknown sources. Set the distances between 0 and 210mm Export the data that you gather for later analysis. Preset experiments to get your students started. 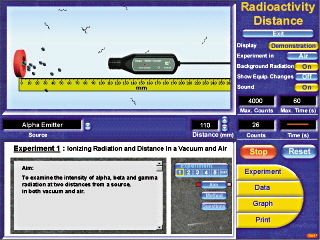 Simulate the experiments of Rutherford and his collaborators. Investigate the relationships between metal thickness, particle energy, target atomic number and alpha particle back scatter. Set alpha particle energy between 1 and 10MeV and set barrier thickness. Select from 11 barrier materials including gold and iron. The Teachers’ manuals include blackline masters for 13 experiments.